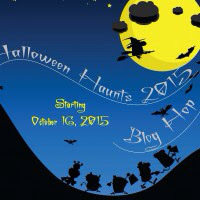 Hello everyone, welcome to "In The Boon Docks" today is my day for the Halloween Haunts 2015 Blog Hop! I am so excited to share a little history and some new Halloween projects I have been working on for this hop! Thank you Marian of Seams To Be Sew for organizing this great hop! I love being back with so many familiar blogs. Many of us have done hops for years together! I am enjoying the new blogs too! So much talent in this hop! I appreciate what you have taken on for everyone's enjoyment! 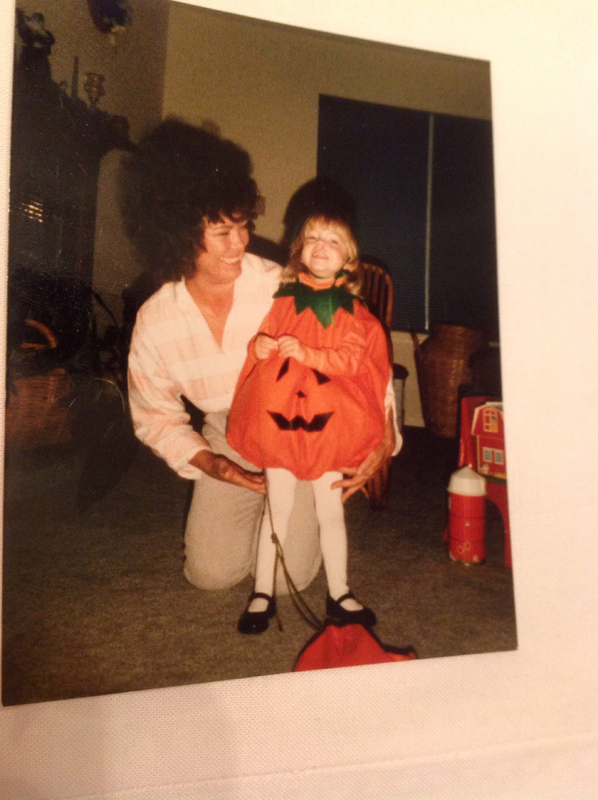 In 1990, my Mom came for Halloween. I was pregnant and had nothing for my daughter to wear for Halloween. I had never seen my mother sew anything! In a day, she dyed a white sheet and a long sleeve shirt orange. She went shopping for ribbon, elastic, green and black felt. Made a pattern out of newspaper for the pumpkin face, green around the neck, and a hat. Sewed it into this awesome pumpkin costume for my oldest daughter Ashley! What a great costume! Five other children would wear it before I put it in a keepsake box. See that little green hat, all made of felt and a piece of ribbon. So, if your looking for a easy kid's costume idea this is it. I am sure if you spend the time to make a costume for your child you will cherish it later! What did I make for the blog hop? Living with to guys (husband and grandson) I try to find skull fabric whenever I can. When my hubby saw this fabric he wanted a new pouch to keep his medicine! I thought well it is a little Halloweenish. The mini quilt was made by cutting a 3" hexagon in half and making cardboard templates! I think it turned out just scary enough for Halloween! This little pincushion came out really cute don't you think? I really love Spellbound, by Cotton and Steel! It all started with a 2" hexagon. So stop by: Seams To Be Sew to enter! Marty, if you stop by today, I am home and have been waiting for you for 30 years! Back To The Future Rules! Today is the day! Nobody likes to be first so today I will be! Look at that cute pumpkin down below! The lady has a pattern for it! I love that story about your mum, a great costume & memory. We don't celebrate Halloween down here! .. sometimes we get a kid knocking on our door for choccies but that has only happened twice! Very nice!! Love the costume too. Very cute. Love the costume, too. Fun projects! I really love the pincushion. The pumpkin costume is great! Your projects are so much fun. Cute costume! Love the pincushion. Nice job on the zipper pouch and quilt too! We can only hope that Marty got the Cubs prediction right...if not he can just go back to the future!! 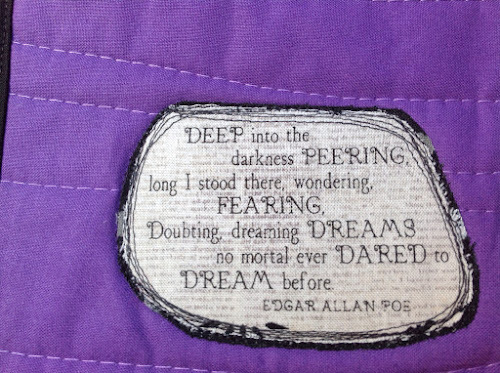 I liked your Poe quote on you quilt. Who does it better than Poe!! Nice post. Love the pincusion too and you made fun projects! Love all of your projects especially the pin cushion. Your back to the past photos of your mom and daughter are simply wonderful. Nice projects! The pincushion is spectacular, also like your quilt and the colors you chose. I'm also into pin cushions and love yours. I guess it's my favorite of all your cute items with the pouch running a close second. Your work is very neat too..
Oh I do remember those days of making costumes. Your so right about the keepsake box. ;-) Cute projects...and oh so useful! We always did homemade costumes (and my daughter now does with her littel ones). Cute projects and thank you for sharing. Cute projects! I'm making a puppy costume this year. My older kids have fun making their own costumes. What a precious memory & photo! Great projects as well!! Oh, such a sweet memory of your mother and that costume...love it! My grandsons would love those great skeleton projects and I think the spider on the pincushion is awesome! That pumpkin costume is certainly a treasure. I am so glad that you have kept it over the years. Your skeletal projects are perfect for the males in the house! Great Halloween projects! 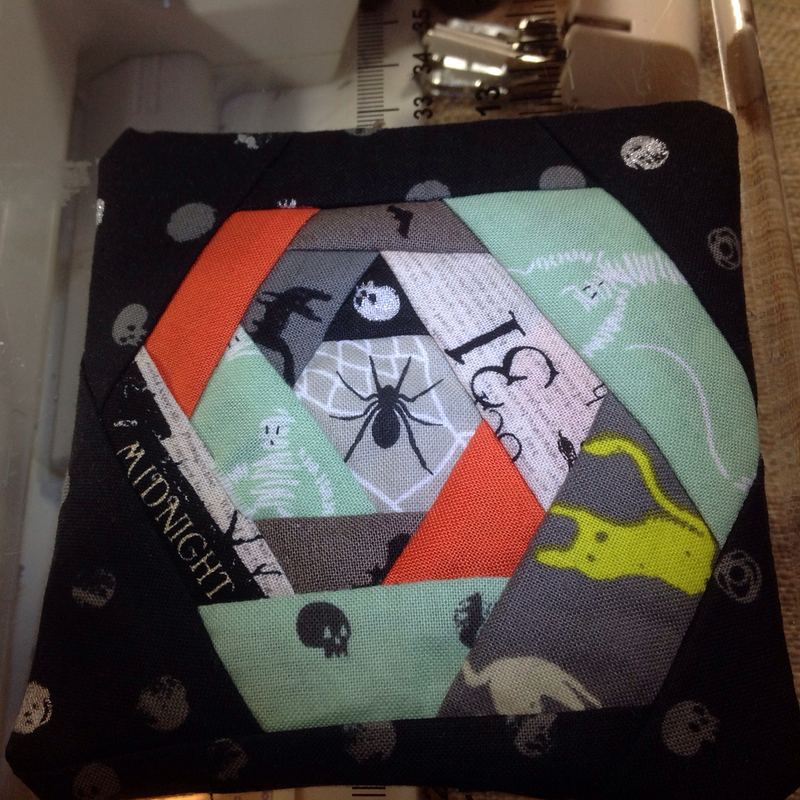 Your mini quilt is spooktacular! Have you found where we can get our hover boards??? What a treasure and memories the costume your mother created with lots of love for her granddaughter is. 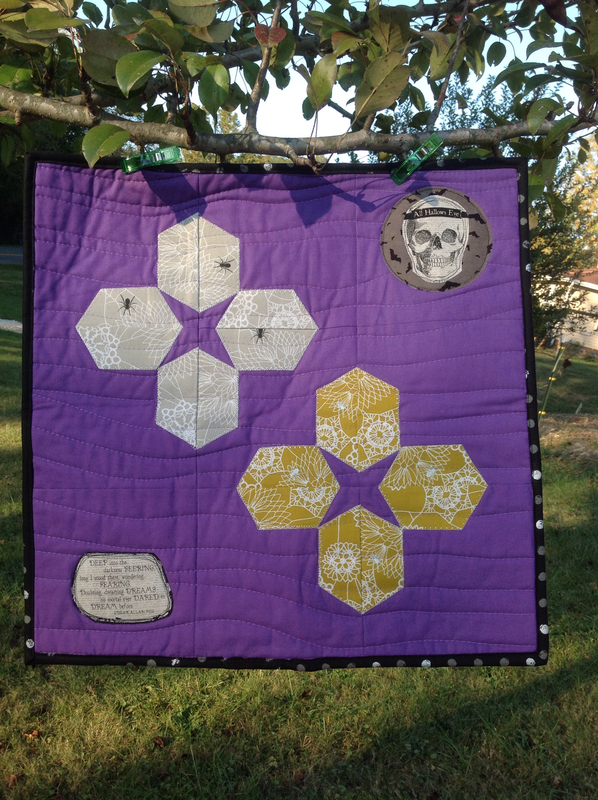 Love the hexagon quilt . Happy HALLOWEEN. I love the story of the pumpkin costume and how your kids have all worn it, and aren't mom's just amazing. I still admire my mom for being able to sew Barbie doll clothes, I would never attempt it. The spiders on the hexies are really cool, it almost looks like one of them is coming out of a pocket and I had to look really close cause I wondered if those hexies weren't pocketed, they almost look like they are. Great job, thank you so much for sharing your fabulous projects today. I don't sew row Halloweenie, but glad you do! Fantastic project! Wonderful memories, too. I am a big fan of homemade costumes and your mom made a great one! Your projects are lovely, the pincushion is my very favorite. Your mom was very creative. What a fun costume. I love the fussy cutting on the pin cushion. 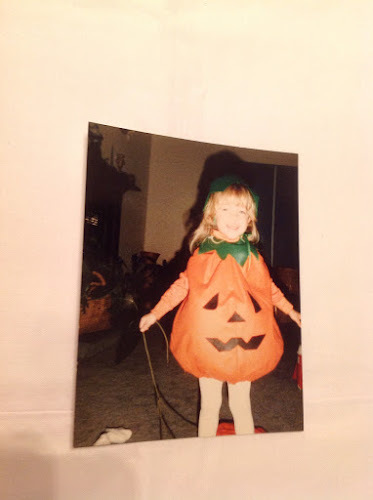 My oldest's daughter first costume was a pumpkin too! Love your projects. Cool little bag. Thanks for sharing with us. 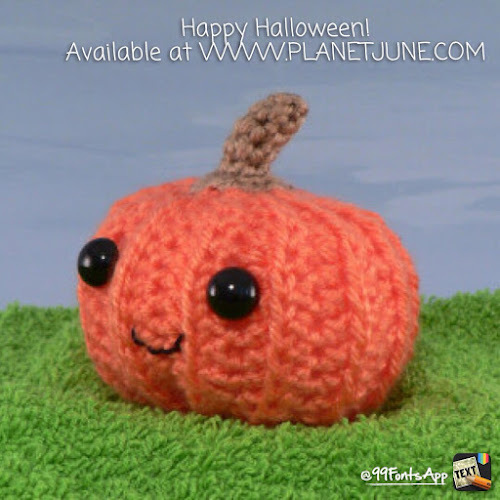 The pumpkin costume that your mother made is adorable! Thanks! My son mentioned the Back to the Future date to me today...one of my all time favorite movies. Love the costume. Thanks for sharing! You have been wickedly busy! Really like the zip bag. I love that bag for your Hubby! and Your projects are WONDERFUL! Such cute .... and maybe a tiny bit scary.....projects! I love how your Mom saved Halloween with the pumpkin costume. Thanks for sharing! I love the story about your mom and that you saved the costume. Great pincushion too! love the pic of you and your mom. Awesome memories you share. Thanks. Love your projects.... especially the pincushion! thanks for sharing all your nice projects. 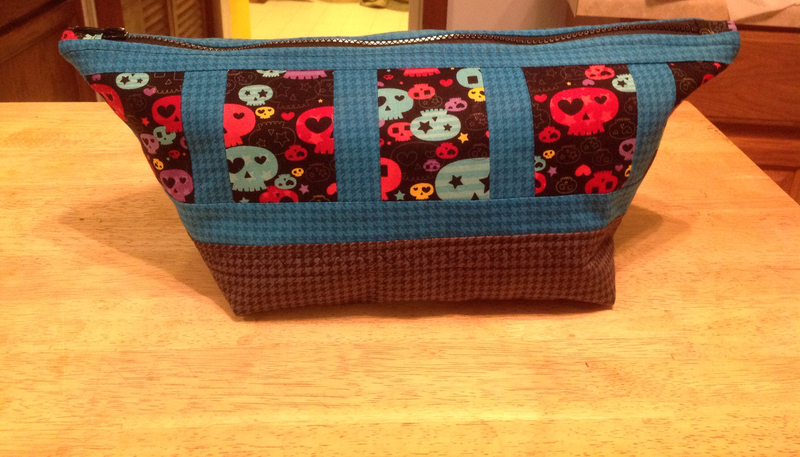 Love the pouch with the skulls !!! Very nice pouch and quilt, but I love the pincushion! All three are adorable. I need to make me a pin cushion like that one though. Can always use another. Sounds like your mother was very artistic, cute costume for a cute little girl. Yeah, I've been waiting all day for Marty too! Your old photo reminded me of how many costumes I've made for my kids. Hopefully, someday they'll be pulled out to outfit my grandkids and the joy will start all over again! Thank you for sharing! Happy Halloween! Great projects, Thanks for the old pictures too they are fun! What a prolific quilter you are! I love all your projects, and I enjoyed reading your post! 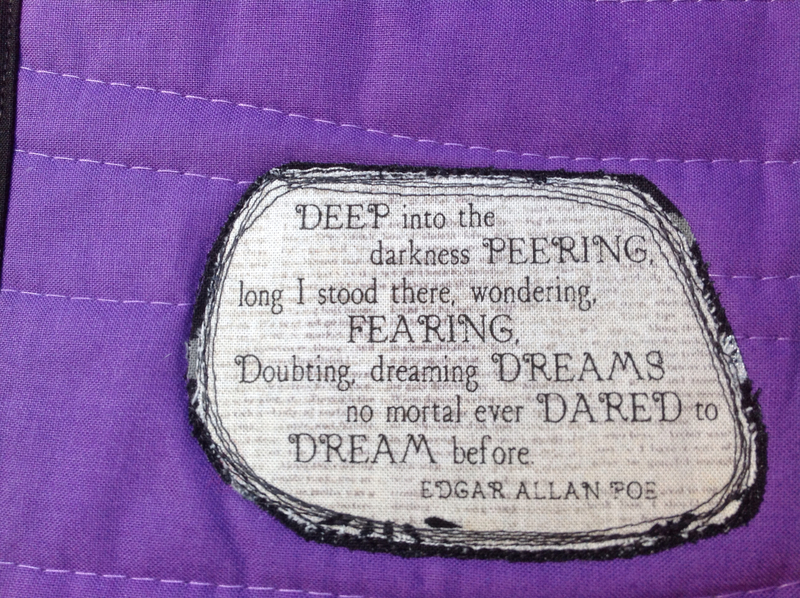 Love the hexie pincushion and the Poe quote! Cute post. Love your pincushion too. Love the picture and the pumpkin costume, so cute! Your projects are wonderful too! Happy Halloween! A great costume. So nice that it lasted more than one year. I've made some that have had a few uses also -- my most challenging year included three 3-4 year old Tinkerbells and one 3 year old Captain Hook! The pincushion is the best and the costume of course. I love your projects. But I have to share about Marty. Made my kids watch part II tonight. How fun to see "today" from 1985. You are so right about finding masculine fabric, I also usually turn to skulls. Love the pouch! Very cute projects! Love the story of your mom making the pumpkin costume. What a cute little pumpkin!! Now that's a costume from the heart. What great memories! All your projects are fabulous.